I will start with a confession: I have a reaction to the generational categorisation and words like Millennials. Whilst I accept certain different cultural norms, expectations, experiences and how the world is in your formative years, I don’t think we can typecast people simply based on the period of their birth. For example, I work with a wonderful business partner who is 26. I am over 49. Yet in the way we live our lives, have attitudes to the world, use technology; I’m the “millennial”. So I think how you are in life is down to your mindset. Shaped, of course, by all your circumstances like place of birth, parents attitude to life, siblings, friends, education, work and life experiences. BUT what I do like, is the thought that we have a generation of optimistic, realistic, practical dreamers who might reboot the system of life and work; upgrade the operating system and install some fantastic apps that we Generation X types can only dream of. That’s not stereotyping young people as the only ones who can change things, that’s admitting that many of my fellow Gen X’ers are a bit trapped by their own design and circumstances. I have a series of hopes that aren’t linked to date of birth ranges, but more about attitudes and aspirations demonstrated by people who are in their 20s and 30s that do appear somewhat different to mine at the same age. Bearing in mind there is no science attached to this, these are merely reflections on relationships and experiences I have had. My expectations are that: My own. I recall being heavily influenced by parents and family in terms of expectations. It was a nice set of guiding principles in many respects, (get a good education; job; partner/marriage; children and comfortable existence). Yet in one generational leap, it’s less about that and more about knowing what’s important to you not the continuance of previous “models”. I like that – it’s breaking traditions that may perhaps stifle someone’s sense of what they’re intended for in life. By yourself. I understand me and want to know more about me. In many ways, my discovery of who I am felt it arrived a little late in life. I don’t see that in my friends and colleagues under 30. I see them MUCH more aware of themselves and what they’re about. I care about things beyond me. Contrary to the belief that all young people are self-obsessed narcissistic, selfie-posting, fragile souls, I see some warrior spirit in people under 30 aggrieved at the mess the older generation has made of the planet, politics and humanity. OK not all people of a certain age, but certainly the eager, driven professionals I come across have connected the dots and want to make a different to the world. I guess before we start to throw mud at young people thinking they’re all the things some of the press might have us think, let’s stop and check in on our experiences with the Millennial set. And meet them on their terms. As an older, experienced member of the community what can you offer them in terms of wisdom, support and guidance and less preach, criticise and mislabel all their deeds as self-centred ones. I maintain it’s about understanding to overcome stereotypes. It’s about dialogue that builds greater connections, and about tolerance of difference that we should all do more of around age, gender, race, religion, sexuality and ability. Am I pro-Millennial? Of course I am. It’s the mindset I’ve adopted (digital, experiential, making a difference to the world) that are the so called archetypes of that generation. Am I anti-GenX? Of course not; but I do recognise how decisions previous generations have made can create obstacles and issues for those that follow. Tolerance, dialogue, understanding and all about difference. Celebrating difference ought not be exclusively the trait of a millennial. So let’s do our future proud by all being more celebratory of our differences. And that’s how I think Millennials will manage Generation X: Help them manage a more tolerant, dialogue-based and difference-tuned way to be. 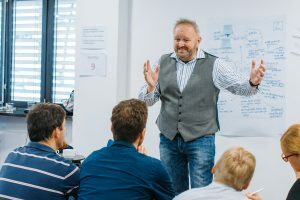 Perry Timms is Founder and Chief Energy Officer of PTHR, Chartered Member of CIPD; 2x TEDx and international speaker; Author of Transformational HR; Adjunct Faculty and Visiting Fellow of Hult International and Sheffield Hallam University Business Schools and Guest Professor at GEA College in Ljubljana.